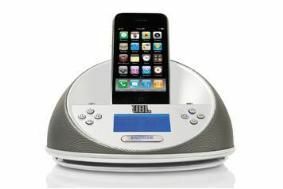 JBL On Time Micro iPod dock provides a wake-up call | What Hi-Fi? This two-in-one alarm clock and iPod docking station is compatible with all versions of the Apple iPhone and iPod (including iPod nano G3, iPod Classic and iPod Touch), and can also be connected to other MP3 and CD players, PCs and laptops via its 3.5mm aux input. You can select any source connected to the dock to play when the alarm is activated. Power is 2 x 6W, frequency response 70Hz to 20kHz and the two built-in Phoenix speakers have neodymium magnets. The unit is available in black or white from retailers including Best Buy and Apple Stores.